Gently roasted in their nutrient rich skins and lightly salted, these super extra-large Virginia peanuts pack a distinctive and hearty crunch. 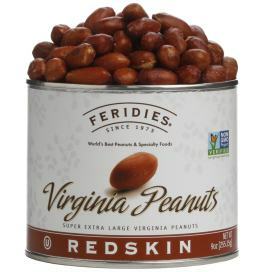 Redskin peanuts are the ones with the red skins still on them. This red skin is between the outer shell and the peanut and it is full of nutrients. 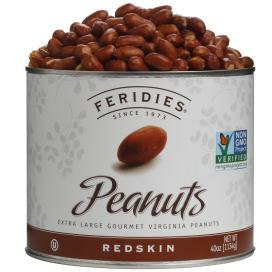 For our Redskin Peanuts, we have left this skin intact so you can enjoy all of the added benefits of them. At the end of the process, we are left with the same peanuts but there is a different taste experience for you. They contain a lot of flavor, making them the perfect snack no matter where you are. 17% oil - This natural oil is great for your body and can help keep you healthy. It supports healthy skin, hair and nails. It also helps to boost immunity. Fatty acids - Fatty acids are good for brain development, regulating blood pressure, and helping to strengthen the immune system. High in fiber - Fiber is great for your body because it helps keep you regular. It can also lower cholesterol levels and help in controlling blood sugar levels. It has also shown to help with losing weight. Contains resveratrol - This is the same antioxidant that is in red wine. It is antimicrobial and has shown to lower blood sugar. It may even be a key component to fighting cancer. Added antioxidants - A study in 2009 has shown that peanuts that have been roasted with the skin have an increased amount of antioxidants. 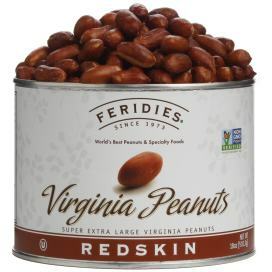 Our Redskin Virginia Peanuts are OU Kosher Certified and Non-GMO Project Verified. They are available in a variety of sizes for your personal enjoyment or gift-giving needs.